Liquid « Global Market Insights, Inc. Sodium silicate market, an inherent vertical of the specialty chemicals space, has already established its name in the billion-dollar league, owing to the extensive demand of the chemical compound across myriad end-use domains. Pertaining to the product’s low cost and ease of use, it has been deployed as a detergent, adhesive, cleaning compound, cement ingredient, binder, coagulating agent, and anticorrosive agent in numerous sectors, propelling sodium silicate market size. Indeed, the compound’s widespread and almost all-encompassing presence has facilitated sodium silicate industry to maintain a steady growth graph. The compound is also used as a catalyst, thus generating another profitable growth avenue for sodium silicate market. With continuous research and development programs being conducted to expand the area of application of the compound, it is certain that sodium silicate industry will continue to uphold its profitable position over 2017-2024.Detergents are one of the prime application arenas of sodium silicate industry since decades. This chemical compound is rather to incorporate into the detergent paste and helps in maintaining the viscosity and desired density of the detergent. The product is highly effective in removing spots, neutralizing acidic stains, dispersing proteins and suspending greasy particles in the wash liquid, thus impelling sodium silicate industry size from the detergent manufacturing sector. It has been observed that among the varied uses of sodium silicate, the compound is known to efficiently function as a good adhesive. The subsequent deployment of this product as an adhesive has led to a major impetus in the growth graph of sodium silicate market. Sodium silicate adhesives have the inherent ability to easily expand and make contact, forming a rigid layer that is permanent, resistant to tears, and even possesses the capacity to withstand water and heat. The compatibility of sodium silicate adhesives on a varied range of substances like paper, metal and wood besides other materials, has spurred the sodium silicate market share further. Of late, sodium silicate has found extensive application as an effective catalyst for the synthesis of biodiesels that have gained popularity as a sustainable fuel. 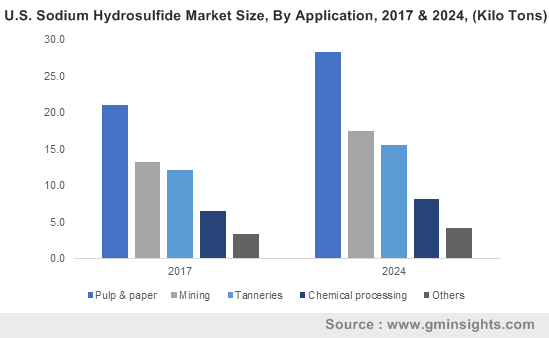 Currently, amidst the backdrop of a scenario where the lookout for alternative fuel sources has become a race against time, manufacturing biodiesels through the transesterification of organic materials has become rather commonplace. In a bid to simplify the process, sodium silicate is used as an effective catalyst, thereby stimulating sodium silicate industry outlook. The ease of procuring the chemical compound has reinforced its position as a catalyst in the transesterification process. 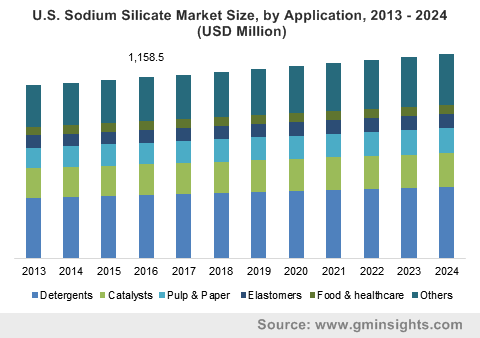 As biodiesels will continue to attain increased application in energy generation and alternative fuel source, sodium silicate market trends will continue to witness a dynamic transformation in the ensuing years. Sodium silicate is used widely in other application domains such as water treatment, casting, coating, textiles, agglomeration, chemical injection, paper treatment and more. In consequence, this would prove to be a rather beneficial for the commercialization graph of sodium silicate market over the next few years. With numerous chemical companies working toward expanding the application scope of this compound, in addition to innumerable research & development programs being conducted to unearth further prospective product uses, sodium silicate market has been forecast to garner commendable profits over 2017-2024. This entry was posted in Bulk & Specialty Chemicals and tagged Catalyst, Detergent, Elastomers, Food, Healthcare, Liquid, Paper & Pulp, Powder, Sodium Silicate Market, Sodium Silicate Market Report, Sodium Silicate Market Research, Sodium Silicate Market Size, Sodium Silicate Market Study. Solvay’s latest investment in Germany is an archetypical instance of the varied and vast expanse of sodium bicarbonate market. The Belgium-based specialty chemicals firm has invested around EUR 6 million apparently, to expand its sodium bicarbonate production capacity in Rheinberg, Germany. Touted as a rather strategic and well-thought out plan by the sodium bicarbonate industry player, this investment is targeted at providing Solvay’s customers with the SOLVAir SB 0/3. This solution, a ready-to-use product for lowering pollutant atmospheric emissions, is specifically designed to aid factories meet environmental regulations with lesser operational costs. While helping to purify air quality does not typically fall under the regular applications of sodium bicarbonate, Solvay’s commitment toward lowering carbon footprints sheds light on the increasing deployment of this product in the industrial sector. The usage of baking soda for myriad functionalities in agriculture, though acknowledged since long, however, has been commercialized only in recent years. One of the most pivotal reasons why the agricultural domain has essentially constituted the end-use segment of sodium bicarbonate industry is the globally rising population. With the number of denizens across the globe increasing at a breakneck pace, the demand for food has observed a remarkable ascent, leading to increasing crop cultivation. In consequence, this demands the usage of sodium bicarbonate as an effective agent to treat insects in farmlands and more importantly, washing away pesticides from fruits and vegetables. A recent study demonstrated that since most pesticides such as thiabendazole and phosmet remain unstable at an alkaline pH, the application of baking soda conveniently breaks down the compounds and washes them away, thus enabling sodium bicarbonate market to benefit massively from the agrochemical sector. Recently conducted R&D programs have depicted that sodium bicarbonate can also be effectively used for healthy plant growth, sans the danger of harmful fungal diseases. Adding water infused with baking soda to soil has been found to keep the soil at an appropriate level, prevent the growth of mildew or mold, and maintain the pH level of soil. In consequence, the farming community seems to have wholeheartedly adopted the methodology of deploying baking soda – a trend that has led to better crop cultivation and healthy yields. While the technique is yet to gain mass approval, its interim success has proved to be rather beneficial for sodium bicarbonate market. It is imperative to state that the agricultural domain constitutes merely a fraction of the vast end-use landscape of sodium bicarbonate industry. The product finds numerous applications across the industrial animal feed, personal care, pharmaceutical, animal feed, and the food & beverage sectors – the food industry in fact, is one of the largest consumers of sodium bicarbonate. Research and development activities however, are being extensively conducted across this sphere, in order to uncover further areas of product deployment. While the rising usage of sodium acetate and yeast may have a slightly negative impact on the revenue graph of sodium bicarbonate market, the product’s numerous benefits supporting its extensive demand across a slew of domains will help propel the business vertical. 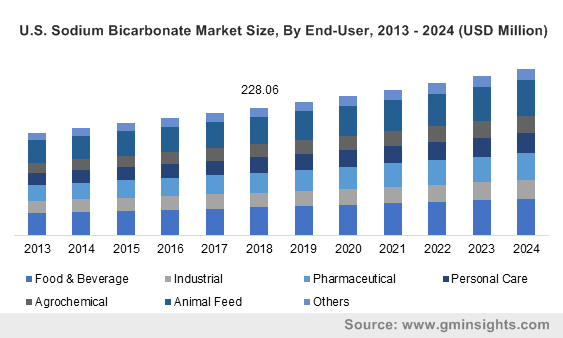 Endorsed by a comprehensive, far-flung application spectrum, sodium bicarbonate market size is expected to cross USD 9 billion by 2024. This entry was posted in Bulk & Specialty Chemicals and tagged Crystal, Global Sodium Bicarbonate Market, Liquid, Powdered Crystal, Slurry, Sodium Bicarbonate Market, Sodium Bicarbonate Market Report, Sodium Bicarbonate Market Research, Sodium Bicarbonate Market Size, World Sodium Bicarbonate Market. Endorsing a wide application scope in fodder business space, the profitability quotient of non-protein nitrogen in feed market is projected to substantially upscale in the coming years. Over the past few years, animal nutrition has managed to grab a bigger role than anticipated. Manufacturers across the world have been increasingly investing in R&D activities to develop a palate of new protein sources which expectedly would widen up the non-protein nitrogen in feed industry opportunities. In this regard, it is prudent to mention that protein-rich leguminous fodders are usually not extensively grown in many areas, which are prone to attack by ruminants, as they are comparatively more expensive than non-protein nitrogen sources. The growth of non-protein nitrogen in feed industry can be fundamentally credited to this factor. Global Market Insights Inc., forecasts the overall non-protein nitrogen in feed market size to record a valuation of over USD 1 billion by 2024. Speaking of commercialization potential of non-protein nitrogen in feed industry, it is nothing but enormous. The increasing consumption of meat bears an evidence to the fact. As per estimates by WHO, annual meat production will surpass 376 million tons by the end of 2030, which is an exceptional rise from that recorded in the year 1999- 218 million tons. The world population presently consumes 75 pounds of meat per person annually, as cited by the Organization for Economic Cooperation & Development. The sharp incline in the meat consumption has undoubtedly left a perpetual impact on the demand for non-protein nitrogen in feed market. A recent report brought forth by U.S. Food and Agriculture Organization claims that global meat production will be 16% higher in 2025, from that what it recorded over 2013-2015. These statistics quite profoundly depicts the increasing pressure on livestock breeding to address the increasing demand for animal nutrition, indirectly leaving a subsequent impact on non-protein nitrogen in feed market share. The most common non-protein nitrogen source which is extensively deployed in ruminant feeding is urea. Though there are other sources that have been experimentally and commercially deployed, urea holds quite a prominent position in the global industry landscape. Estimates depict, overall non-protein nitrogen in feed market share from urea accounted for a revenue of USD 550 million in 2016. Some of the prime factors that have driven non-protein nitrogen in feed market share from urea include higher nitrogen content of almost 46.7%, reduced live weight loss, low cost, and increased intake of dry roughage. In addition to this, being the building blocks of non-protein sources, it can be easily fed to ruminants as a replacement for a part of protein in a ration. The ability of micro-organisms present in the rumen of sheep and cattle to utilize these non-protein sources or urea eradicates the requirement of imported protein supplements, with no hazardous impact on animal health. Having procured almost 75% of the overall non-protein nitrogen in feed industry share, urea is slated to drive the product landscape in the coming years. However, urea toxicity and stringent regulatory framework pertaining to its production in some areas might hamper the industry growth to some extent. However, changing healthcare dynamics and food preferences are some of the pivotal factors providing a significant push to the global non-protein nitrogen in feed industry trends. In this regard, Asia Pacific has established a strong foothold in the worldwide fraternity, with increasing proliferation of advanced technology for effective synthesis of protein from non-protein sources. In fact, estimates claim a humongous portion of urea to be consumed in Asian countries like India, China, and Japan, to maintain and boost livestock health and nutrition, particularly ruminants. A subsequent rise in research investments from international producers as well as spreading awareness regarding the usage of nutritious forage has led APAC non-protein nitrogen in feed industry size to record a valuation USD 400 million in 2016. The exponential rise in the livestock population over the past couple of years will certainly propel the regional market demand to great heights in the years ahead. Worldwide, non-protein nitrogen in feed industry encompasses a host of renowned biggies including Yara International ASA, Incitec Pivot, Archer Daniels Midland Company, The Potash Corporation of Saskatchewan, and Borealis. The marketplace seems to be pretty much consolidated with leading giants’ relentless effort in strengthening their business position by underlying various growth strategies such as joint ventures, product differentiation, production capacity expansion etc. An upswing in global meat production, subject to its increased consumption undeniably remains one of the principal factors driving non-protein nitrogen in feed market size. 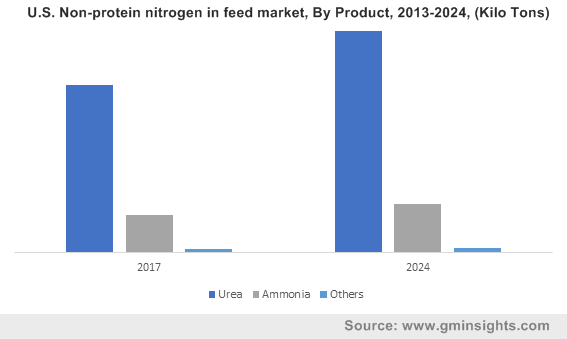 Moreover, the expansion in supply chain and technological advancements with regards to product manufacturing are further expected to carve a lucrative roadmap for non-protein nitrogen in feed industry over the ensuing years. This entry was posted in FOOD, NUTRITION AND ANIMAL FEED and tagged Ammonia, Dry, Feed Non-Protein Nitrogen Market, Feed Non-Protein Nitrogen Market Size, Liquid, Livestock, Non-Protein Nitrogen in Feed Market, Non-Protein Nitrogen in Feed Market Size, Poultry, Ruminant, Swine, Urea. The global calcium nitrate market share is touted to soar high in the coming years primarily propelled by the increasing prominence of wastewater treatment across the globe coupled with growing healthcare & pollution control initiatives. As per estimations by the United Nations, the amount of wastewater generated yearly is about 1,500 km3, which is six times more than the water that exists in all the rivers across the world. Over the past decade, due to the rise in industrial pollution optimum management of wastewater has emerged as a major challenge for governments worldwide. According to the World Health Organization, unsafe or insufficient water, hygiene, and sanitation issues cause approximately 3.1% of all global deaths, and 3.7% of DALYs (Disability Adjusted Life Years) globally. Calcium nitrate is extensively used in wastewater treatment facilities to minimize foul odors by up to 90 percent, by stopping the wastewater from becoming septic. 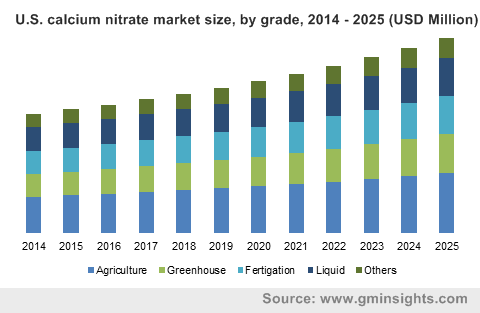 The constant increase in clean water demand amid possible threats of biological contaminates has also been lending positive momentum to calcium nitrate market growth. Of late, the product apparently has also gained recognition in the solar power sector – it is used as molten salt in solar towers. As the energy sector expands further with renewable alternatives and solar power projects are anticipated to grow in number, the revenue graph of calcium nitrate market is anticipated to depict exponential growth. Some of the key organizations having a significant foothold of the calcium nitrate market are Airedale Chemical, Vardhaman Fertilizers & Seeds Pvt. Ltd., Agrium Inc., Yara International ASA, Rural Liquid Fertilisers, Haifa Chemicals Ltd, and GFS Chemicals, Inc. These organizations, as is observed, have been working to expand their manufacturing capacities, geographical reach, and have also been introducing new business units, particularly across developing economies, such as the ones in the Asia Pacific where labor and property costs are economical. Citing an example of industrial expansion, in 2017, Haifa Chemicals Limited launched its new business subsidiary in Colombia called the Haifa Colombia SAS. The new facility reportedly provides plant nutrition solutions to distributors in the local periphery, helping the firm in establishing itself in the Colombia market. Calcium nitrate market size from fertilizers has been exponentially surging over the last few years due to increasing consumer efforts pertaining to improving yield quality and boosting profitability from agricultural trade. Some of the major contenders of the calcium nitrate fertilizer market have been constantly reinventing & innovating their crop nutrition portfolios to deliver increased crop yield and improved crop quality with minimum environmental impact. Citing an instance, Yara, a fertilizer behemoth, is renown to offer an extensive collection of cutting-edge calcium nitrate based fertilizing solutions, called YaraLiva. The YaraLiva calcium nitrates employ quick-acting nitrate-N, in conjunction with strength-developing calcium, and the unconventional collaboration of these two nutrients fuels longer growth. Trees and plants treated with calcium nitrate fertilizers become naturally healthy and are less sensitive to growth stress. Acting proactively through sprout to harvest, these fertilizers enhance the appearance, strength, stature, glow, and size of the tuber, fruit, lettuce, seed, vegetable, or leaf being cultivated. In consequence, with calcium nitrate fertilizers, farmers can harvest high-value, healthy, and highly saleable produce. Considering the soaring demand for food worldwide, the requirement of these fertilizers is only bound to increase, which would help augment calcium nitrate market share from fertilizers in the years ahead. Wastewater plays host to a number of undesirable substances, some of which can prove to be extremely harmful if left untreated. Water has to be treated with appropriate processes & chemicals to remove solid suspended particles and avoid penetration of disease-causing virus, bacteria, and protozoa. The bacteria in untreated wastewater can undergo a chemical reaction to generate active sulphides, post which hydrogen molecules bond with these sulphides to create malodourous H2S gas, imparting an unbearable stench to wastewater. When used in a treatment plant, calcium nitrate provides an alternate oxygen source that disrupts the development of H₂S gas. Reduced concentrations of H₂S entail less foul odor, lower corrosion of assets, and increased compliance of WHS (Work Health and Safety) regulations. Amidst growing water safety concerns, the rising implementation of calcium nitrate across water treatment facilities worldwide is projected to substantially elevate the industry growth in the coming years. With the surging utilization of calcium nitrate across a plethora of applications in government, industrial, and agricultural sectors, it goes without saying that the commercialization graph of calcium nitrate industry will depict a commendable incline over the coming years. As per estimates, the overall calcium nitrate market size is projected to cross USD 12.6 billion by 2025. This entry was posted in Bulk & Specialty Chemicals and tagged Agriculture, Calcium Nitrate Market, Calcium Nitrate Market Share, Calcium Nitrate Market Size, Concrete Manufacturing, Explosives, Fertigation, Fertilizers, Global Calcium Nitrate Market, Greenhouse, Liquid, Wastewater Treatment Chemicals.